This book was featured on my library’s Black History Month display shelf, and I grabbed it based purely on the author and title. Toni Morrison pops up early and often in How to Read Literature Like a Professor, so her work has been on my To Read list for some time. Also, I like jazz (Hank Mobley, Art Blakey, Wes Montgomery). It feels kind of silly to say that a book written by a Nobel Prize/Pulitzer Prize winner is “really good”. That’s what I thought, though, when I read Toni Morrison’s Jazz – “She’s really good at writing.” Jazz was published in 1992, a year prior to her Nobel Prize. The setting is 1920s Harlem, sort of. The setting is also “the country”, and trains, and tree branches, and inner worlds and fantasies, and forty years’ worth of time. Morrison’s writing style in this one is…jazzy. It flows and wanders, sometimes challenging, always pretty, sometimes surprising you by returning to an idea again, but in a new way. The plot itself is gruesome – a middle-aged married man has a brief affair with a teenager, and then shoots her. She dies, and the middle-aged man’s wife desecrates the teenager’s corpse at the funeral. Those are the events that the book centers on, sort of. Because of some (jazzy) time jumps, it’s somewhat unclear whether the defining events happen before the shooting and funeral, or after, or haven’t yet happened. Sort of like life, I think? 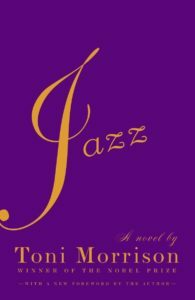 I think she got the Nobel Prize for two books, essentially, ‘Beloved’ and ‘Jazz.’ ‘Jazz’ is truly brilliant post-modern book. Imagine combining Ellington, Faulkner and Maria Callas. That’s the voice that emerges. She’s a masterful craftsperson, which people tend to overlook. She is as great and as innovative as Faulkner and Garcia Marquez and Woolf. That’s why she deserved the Nobel Prize. So, like I said – pretty good.